Download this book on the early history of restoration work at PVC 44 MB. As my skill in using GIS increases, I have been able to carry out more sophisticated analyses. My current advance has been to learn how to incorporate the earliest available air photo (1937) and the Bordner land use data (1938) into recent data, permitting more accurate interpretation of our restoration work. 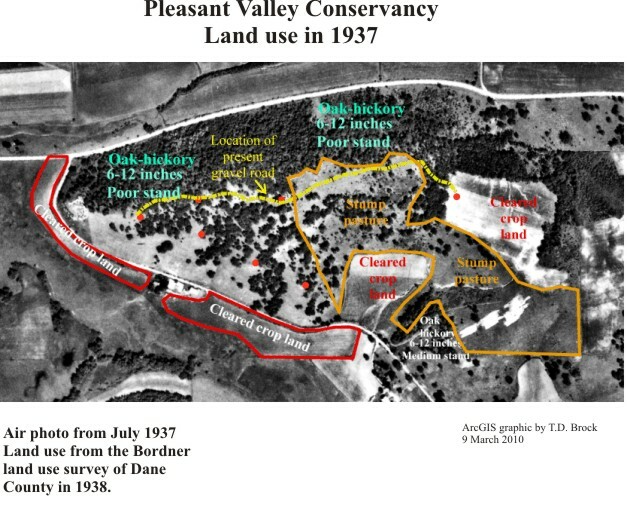 The earliest available air photo of the Pleasant Valley Conservancy area was taken in July 1937 by the U.S. Soil Conservation Service. I purchased a large (9 X 9 inch) contact print of this air photo from the U.S. National Archives. This air photo is of surprisingly good quality, and many useful features can be recognized. I scanned the area including Pleasant Valley Conservancy, created a high-resolution TIFF file, and then georeferenced this image so that it could be incorporated as a "layer" in ArcGIS. Happily, this georeferenced version lined up quite well with the latest (2008 version) orthophoto obtained from wisconsinview.org. 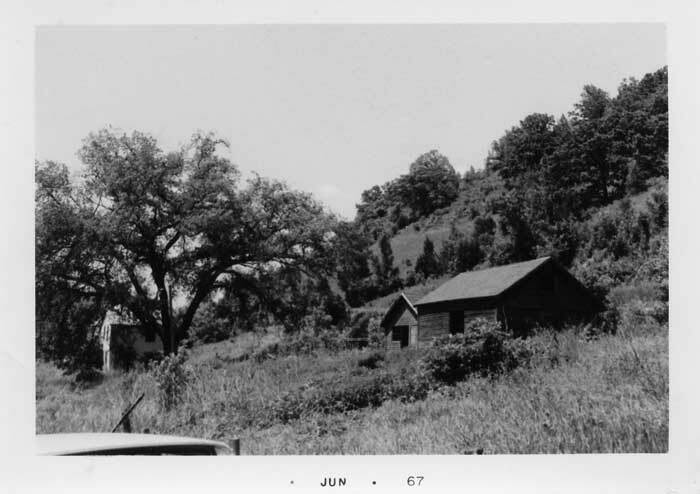 "Often called the "Bordner Survey" after its director, John Bordner, the Wisconsin Land Economic Inventory was a Depression-era project to inventory the land resources of Wisconsin so that they could be used more productively. Field workers, usually trained foresters, tried to touch each "forty" in a county and map current land use and land cover, signs of erosion, and size and quality of stands of timber. Included on the maps are such features as houses, schools, churches, taverns, cheese factories, filling stations, and logging camps. Each map covers one survey township. ....Together, these maps present a portrait of the Wisconsin landscape during the 1930s and 1940s." The Dane County map was published in 1939. Each township was published as a separate map and the area of interest here is in the Town of Vermont. The part of this township that includes Pleasant Valley Conservancy (Section 5) is shown here. The word "Peculiar" on the west side refers to "Peculiar Corners", which was what the juntion of County F and County FF was called in those days. Pleasant Valley Road is the road running down the middle of the map. The outlines on the map indicate specific land-use areas, which are keyed in by the abbreviations. I was able to convert this map to a "georeferenced" version, which could be added as a layer in ArcGIS. Since the georeferenced map and lined up reasonably well with the 1937 air photo. The outlines of the various fields and other areas line up quite well. 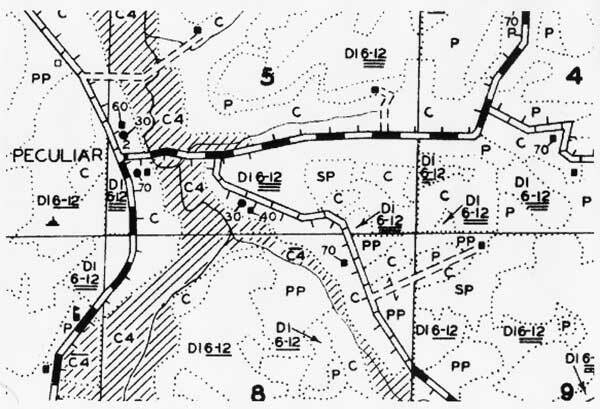 For instance, the two fields labeled "C" in the lower right hand corner of Section 5 correspond to the Pocket Prairie and Toby's Prairie. Once I had all this information layered in ArcGIS, I was able to trace the outlines from the Bordner map and create a new map which is shown on the air photo below. A higher-resolution version (PDF) can be downloaded from this link. Cleared crop land: these were farm fields. Today, all of these fields have been converted to prairie. The field just north of Pleasant Valley Road is the Pocket Prairie and the larger field farther north is Toby's Prairie. The cleared crop land south of PV Road are now the Valley Prairie, Barn Prairie, and Crane Prairie. Stump pasture: This large area, which today is restored oak savanna, is one of the more interesting areas on the Bordner map. It was too hilly to crop, but was not as steep as the south-facing slope. Most of the trees were cut (hence the stumps), but the large trees were left uncut and still exist today as the large open-grown oaks. This area was fenced (we removed a huge amount of barbed wire when we restored it) and the animals were presumably allowed to run free. 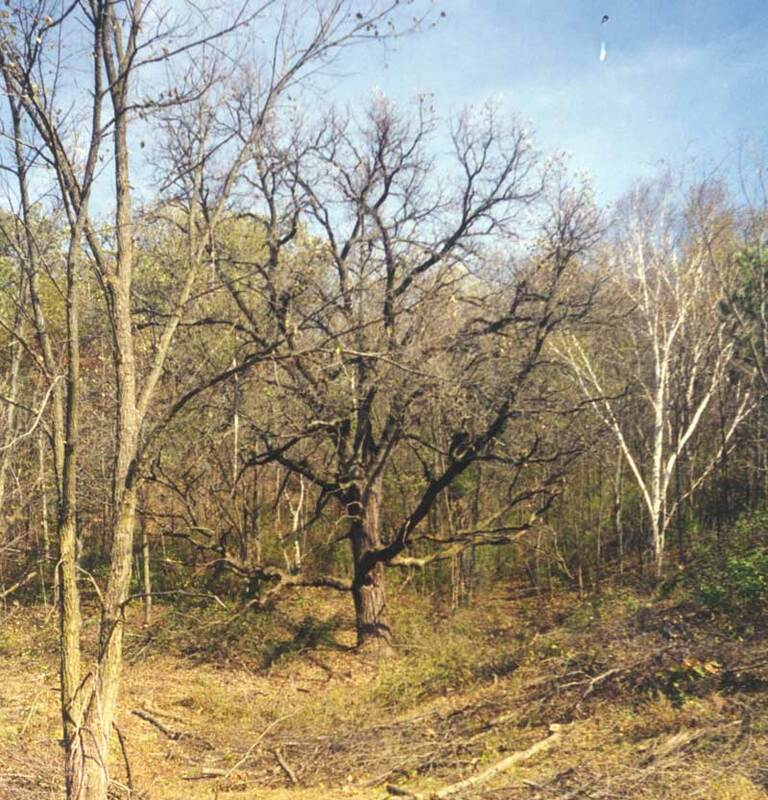 Oak-hickory stands: According to the Bordner survey, most of the land had remained as oak-hickory forest. The labels on this area indicate that the forest was considered poor (third rate). This did not mean that the trees were tiny, but that they were widely scattered, indeed, savanna-like. The numbers indicate the average diameter (breast height) of the trees. Thus, the average oak-hickory diameter at Pleasant Valley Conservancy was 6-12 inches, which were reasonable size trees. Three lines underneath the number indicate that it was a poor stand. The land that is now Pleasant Valley Conservancy was not settled until 1888 when George Lockwood, one of the original English settlers, purchased the land from a land speculator. George’s son James Lockwood acquired the land from his father in 1898 and farmed it until he died in 1931. James’s son Harold and his wife Helen then took over the farm. In 1937, Harold and Helen were divorced and Harold continued to farm alone until he died at the age of 58 in 1957. The probate records for Harold’s estate show that the buildings on the property were only of modest valuation. Discussions with local residents who knew Harold Lockwood stated that he never owned a tractor and all his farming was done with horse-drawn equipment. 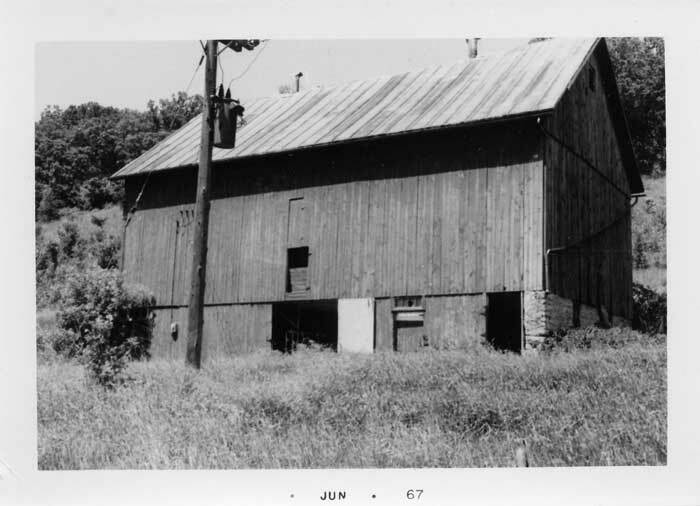 The buildings remaining after Harold Lockwood’s death were in disrepair except for the barn (photos courtesy of Harland Samson). The house and other buildings. Pleasant Valley Road is between the buildings and the steep hill (south-facing slope) beyond. These buildings are now all gone, as is the large elm tree. Some of the bur oaks above on the hill are still there, although 41 years older. The barn was below the road, which is not quite visible in the background. Hay was loaded into the hayloft directly off the road. Although this barn is gone, its foundation still exists and is used as a parking area for employees. Harold’s daughter Gertrude A. Lockwood, sold the farm to George C. and Evelyn A. Cole, who entered bankruptcy two years later. In 1962 the property was acquired by Marshall Erdman and his wife Joyce of Madison, Wisconsin. Erdman was a wealthy builder and developer who owned large amounts of rural land in Dane County and adjacent counties. According to reports, Erdman considered turning the property into a resort, converting the ridge top into a landing field for small airplanes. Whatever the intent, a few years later Erdman sold the property to David Carley, another wealthy Madison business man. (Carley at one time ran for governor of Wisconsin.) It is not clear what Carley’s intent was. The house was presumably rented to tenants, who may have farmed the property, or the tillable land may have been rented to a nearby farmer. 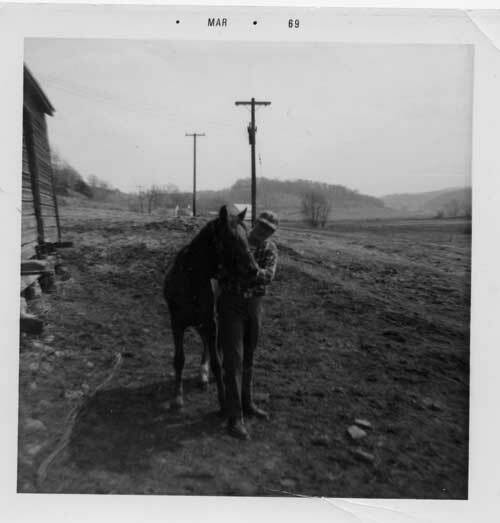 In 1967, Carley sold the farm to Harland E. Samson and his wife Faye who used the land to raise horses. The house on the property was only barely inhabitable, and the Samson’s had the local fire department burn it down for practice. 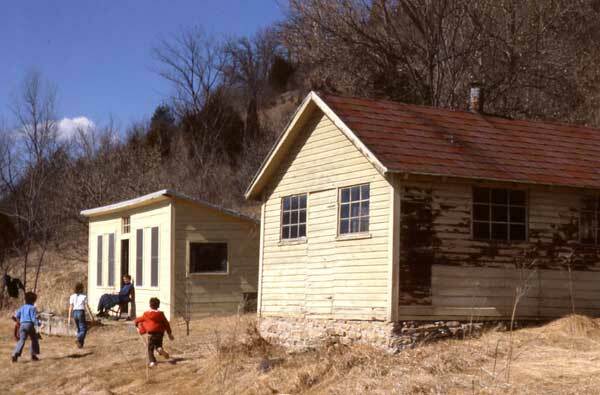 A pig pen on the property was converted into a one-room cabin (shack). This shack has been kept in repair and now serves as a field station of Pleasant Valley Conservancy. The barn burned down on New Year’s Eve 1972. It was replaced by a metal pole barn (still in use). Tom and Kathie Brock purchased the farm from the Samsons in two transactions, in 1980 and 1983. Since 1983 the farm has had not significant development. Restoration work began in 1995 and more seriously in 1998. See this link for an overview of the current buildings at Pleasant Valley Conservancy. Looking up Pleasant Valley in 1969. Although the power lines are gone (now buried), the view up the valley is not much different today. How was the land farmed? Evidence from the 1937 air photo, from the Bordner 1939 land use report, and from observations during restoration provide some insights into how the land was farmed. When the Brocks acquired the property, only about 10 acres of the property was being tilled, under a rental agreement with a neighbor. Another 5 acres (the Pocket Prairie) had at one time been cropped but since the late 1960s had been in permanent hay, which was cut occasionally to feed either horses or sheep. Air photos show that another field (the Crane Prairie) had been farmed before World War II but was not being tilled subsequently. This field is adjacent to the wetland and had been tiled (a few tile remnants indicated the location of the tile field). The steep south-facing had been grazed, as evidence from fences and from visible animal tracks. 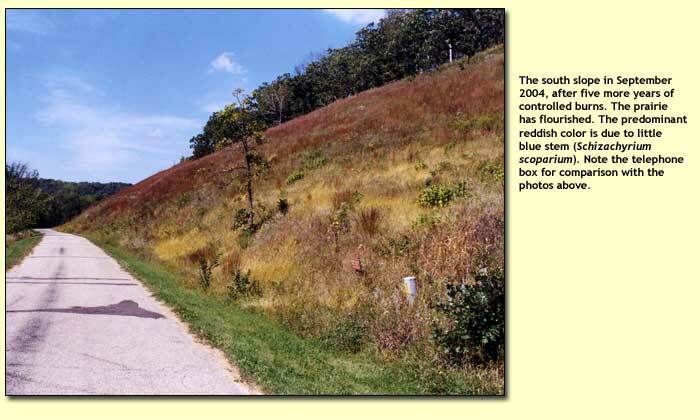 See this link for more details on the plant ecology of the south slope. The savanna above the Pocket Prairie, which is less steep, was also grazed (indicated on the Bordner report as "stump pasture"). Barbed wire fences were everywhere on the property, and their locations indicate areas that were grazed. The only area that had not been either tilled or pastured was the small goat prairie at the west end of the property (Unit 1). This unit is adjacent to the small quarry, and the 1937 air photo shows that this area was fenced off, persumably to keep the cows from tumbling down into the quarry. The 1937 air photo also shows a large area on the ridge top (Unit 11A) that had probably been pastured. This area was virtually treeless and has remained that way until the present day. Many areas that had been open and probably grazed had become, during the years between 1937 and the present, heavily invaded by aspen trees. This clonal species is a pioneer colonizer of open areas. Aspen grew most extensively in the years from around 1960 to 1990, when cattle were no longer being run. One aspen clone, on the south side of Toby's Prairie, has prairie sod, including a large population of prairie violets. 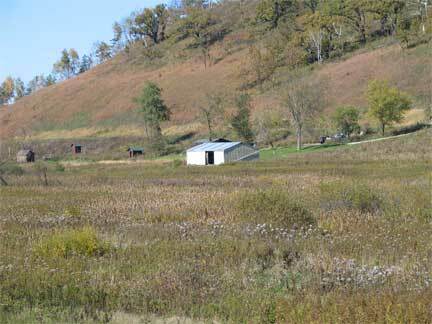 This prairie remnant could have become reestablished after grazing ceased. 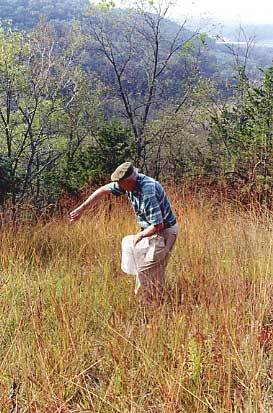 Evidence of native prairie vegetation can be obtained by surveys of the vegetation today. Certain species, such as lead plant, prairie dropseed, and prairie turnip, are known to be eaten preferentially by cattle. One or another of these species was discovered in Units 1, 4, 11A, and 23, where they continue to thrive today, suggesting that these areas were not heavily grazed. This small prairie remnant (Unit 4), high up on the south slope, had become completely hidden from view by invasive shrubs. After a controlled burn, its native population of Indian grass thrived and became the source of all the Indian grass planted in other parts of the Conservancy. In addition to Indian grass, conservative prairie species such as lead plant, prairie dropseed, fringed puccoon, and prairie turnip, are also present in this 0.5 acre remnant. Following restoration, this prairie is now connected with the other prairie remnants farther down the slope. Because of its remote location, this remnant was probably never visited by cattle. Early steps Restoration first began in a tiny way in 1995, under the guidance of ecologist Brian Pruka. Pruka also wrote a suggested management plan which pointed out those areas of highest priority for work. Among these was the goat prairie (Kathie's Prairie or Unit 1), which had to a certain extent remained uninvaded by cedars and exotic shrubs that had made major inroads on the rest of the south slope. This unit was cleared of scattered cedars and in 1997 a controlled burn was run. The prairie responded dramatically to this burn, and lead plant and prairie dropseed flowered well and produced copious amounts of seed. The seed was collected, the first step in what would eventually became a major seed collecting initiative. We had also known that native prairie grasses were present on the south slope, in small patches among the invasive shrubs. Easy to identify were little blue stem and side oats grama grasses. In 1997 ecologist Paul West was hired on a part-time basis to devise a more detailed management plant and to help with identification of native plant species. 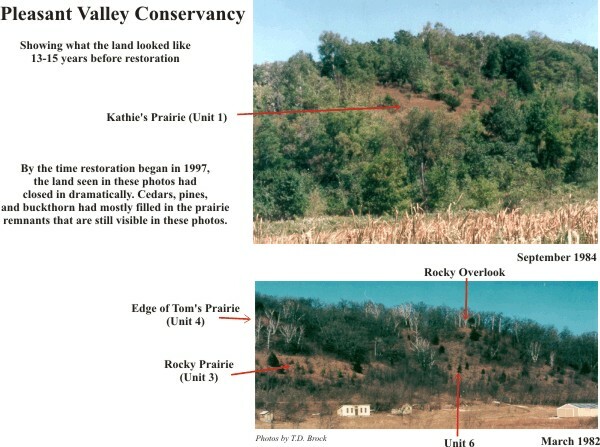 In 1998 an outside contractor was hired to remove all of the invasive trees from around the goat prairie. The contractor also began using the basal bark technique with triclopyr (Garlon 4) to eradicate honeysuckle, buckthorn, and other exotic and invasive shrubs. Some students from the University of Wisconsin were also hired on a part-time basis. By the end of the winter of 1998 most of Units 1, 2, and 3 had been cleared (see Management Map). In April 1998 the Prairie Enthusiasts conducted a controlled burn on the whole south slope. Very little of the slope burned well, except for the original goat prairie (Unit 1). Several days later, the whole south slope was "stripped" with a drip torch to burn further areas. Between this burn, and shrub removal, the prairie grasses began to thrive and spread. Encouraging Results The before-and-after contrast on the south slope is shown in the photos below. A series of on-the-ground photos showing before and after views is given below. The same view in October 2010. The slope has had an annual burn every year since restoration began. 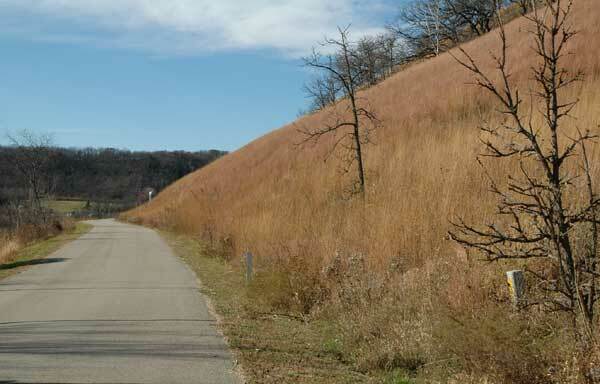 Due to the plentiful rainfall, 2010 was a great year for prairie grass growth on the south slope. Also, considerable work had been done to eliminate smooth brome, making it possible for Indian grass and little bluestem to expand. Panorama view of the south-facing slope, October 2007. 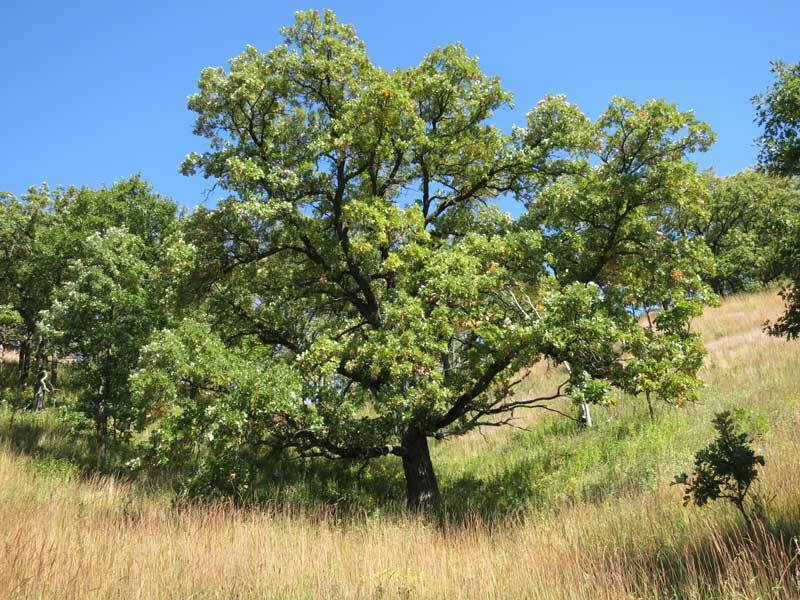 Most of the oaks visible on the upper slope are open-grown bur oaks. Several small remnant prairies are also visible at the top part of the hill farther to the right. As the photo-sequence above shows, we made considerable progress in the ten years after we started clearing the south-facing slope. In 2000 we had just finished clearing this part of the south-facing slope. Brush piles are visible, and cut stems of buckthorn and honeysuckle are present. There is a small prairie remnant just under the rocks (mainly big bluestem), but the rest of the slope is mostly weeds, except for a small patch of little bluestem in the lower middle. Several sumac clones are visible, reminding me that in those days we had not worried about this clonal invasive species yet. 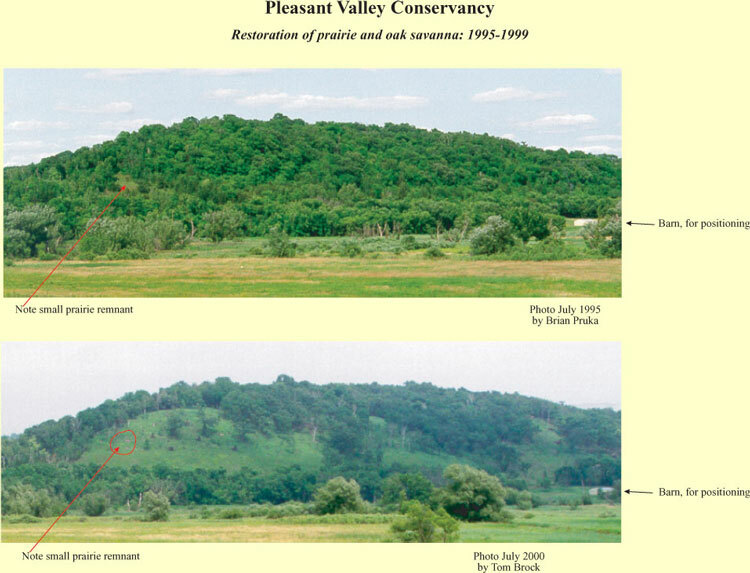 The vegetation in the field below Pleasant Valley Road was primarily smooth brome, since we did not plant that area until the fall of 2002 (now called the Valley Prairie). Along Pleasant Valley Road there was a long row of slippery elms, which were not removed until 2002. The south-facing slope itself has been burned every year and these burns have had dramatic effects. Also, the south-slope has been planted several times with a dry-prairie seed mix. The species list today shows a quite diverse flora. Big bur oak as restoration was just beginning in 1997. The trees and brush in the front are in the process of being removed. The dense brush and trees in the rear will be removed the following year. See photo below for final result. Same bur oak in 2014, after 15 years of annual burns. We have purposely avoided any significant building projects. Buildings are expensive, and tend to become a major focus of activity. We prefer to put our resources into restoration work. The term "shack" has special significance in Wisconsin but is very appropriate here. The building to the left in the photo above has been moderately remodeled and now serves as a field station. The other building was unusuable and was burned down (for practice) by the local volunteer fire department in the late 1980s. 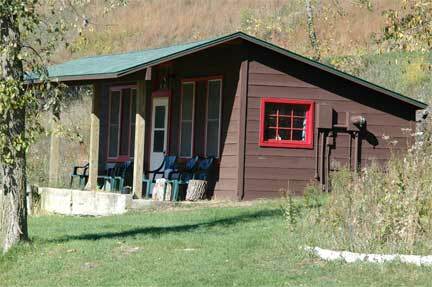 The shack was once a pig pen but has been remodeled into a usable building (compare with the photo below). The shack is a single-room affair. It has electricity but no running water, and is heated only by a wood stove. We have a small library of plant identification manuals, a dissecting microscope, and a refrigerator. We store brush cutters and leaf blowers and some hand tools. This is where we have lunch every day we are in the field. Among other things, lunch is the time when we discuss upcoming projects. Visitors sometimes drop in. Near the cabin, painted to match, is the well house, a very important facility. Although we don't drink the water, we use lots for diluting herbicides and for filling our pumper units for controlled burns. Because the well house is not heated, we have to drain the pump before the first freeze in the fall. Behind the well house, painted to match, is the privy, another important facility. 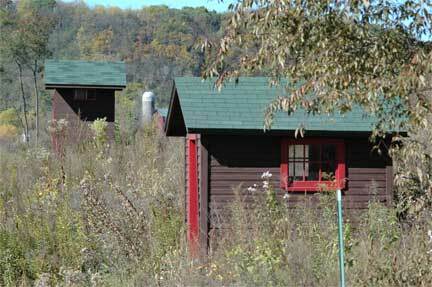 This one was built in 2005 to replace the old one that was housed in the corn crib (see photo below). 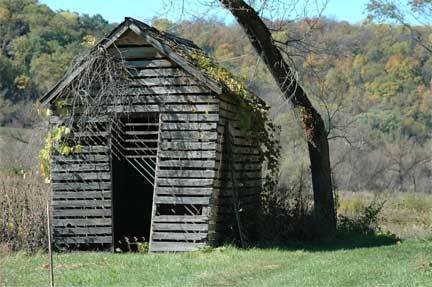 The corn crib was the only building remaining from the original Lockwood farm. It formerly housed the privy, and had probably been used by generations of land owners. Because of our interest in history, we were reluctant to tear it down but because it was complicating the management of the Crane Prairie we finally burned it down in February 2013. See post for details on the burn. This photo shows all the buildings at Pleasant Valley Conservancy. (The cabin is mostly hidden behind the barn.) The small barn was installed by the former owner to keep his horses. It was built in the early 1970s. We added electricity, installed a concrete floor, and built a work shop in one corner. Here we store our Kubota tractor and two Kawasaki Mules and our pumper unit (for controlled burns). We also dry seeds on the concrete floor and hang them from the rafters to overwinter. This photo looks across a small part of our wetland toward the south slope, where prairie remnants and oak savannas dominate. From the cattail marsh to the top of the hill we have a complete John Curtis vegetation continuum. Restoration Continues There is no end to the restoration process. The south slope is about 25 acres, which is only a small part of the 140 acres of Pleasant Valley Conservancy. Most of the savanna is on the ridge tops, and in the basins farther to the east (right in the panorama). 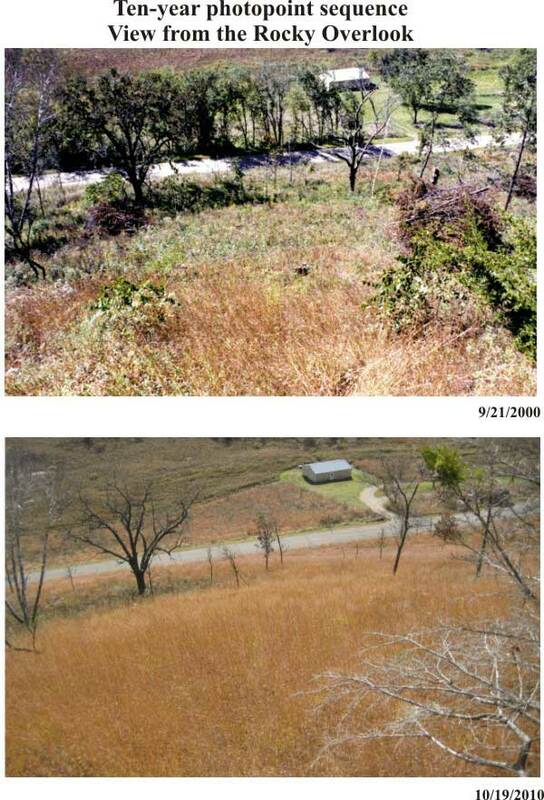 Also, the cleared south slope presents numerous continuing challenges, such as weed control, removal of invasive shrubs arising from the seed bank, etc. etc. This page describes the early history of restoration activities at Pleasant Valley Conservancy. Although restoring the south slope was a major accomplishment, the heavy work was just beginning. The savanna restoration activities are described in other pages.